In spring 2016, the rewards marketing team had an urgent need for a new responsive web experience for rewards activation. They wanted to place ads in the Amazon mobile app for the third and fourth quarters of the year, but Amazon wouldn't allow the placements if Discover didn't have a responsive webpage for their users that clicked on the ads. We had eight weeks to complete the project. I was the lead designer and developer for the site. Since we had a very short timeline and was familiar with the resources already in place on discover.com, I asked if I could pitch designs to the team rather than sending the project to an agency partner. 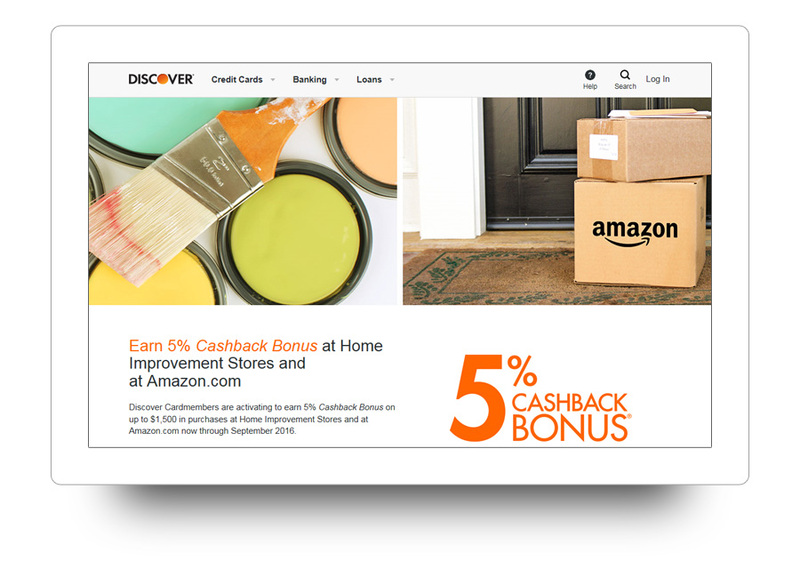 The requirement was simple: provide an Amazon shopper we know is a Discover customer with a simple way to log in to their account and ensure to activate their Amazon.com cash back rewards before completing their purchase. After a single presentation with the project manager and senior rewards marketing leadership, I received approval to move forward. This is an example of the promotional placement on the Amazon mobile app home screen. A smaller placement was inserted on search results pages in order to remind customers at multiple points during their shopping experience. Since the user would be in the middle of a mobile shopping experience, I advocated to keep content to a minimum in order to convert customers to login and activate and get back to their shopping as quickly as possible. The site went live on June 1, 2016, the same day the promotion started. Two weeks later, our placements in the Amazon mobile app went live. 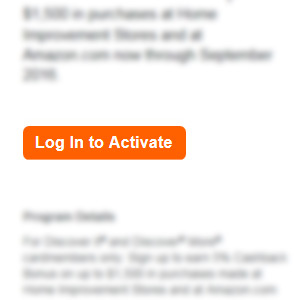 The site was supporting tens of thousands of logins just in the final two weeks of June alone. While Discover's sales performance can be tied specifically to this webpage alone, Discover did experience a significant lift in Amazon.com sales year over year in the fourth quarter 2016. The page has since been updated since I first worked on it, and am no longer on the team that maintains it. That being said, you can visit the live page at https://www.discover.com/credit-cards/exclusives/5percent-current-offer.html. Disclaimer: This webpage is the intellectual property of Discover. It is represented here for the sole purpose of demonstrating the design, technical, and creative abilities of Patrick Puckett. Copyright is available on https://www.discover.com/credit-cards/exclusives/5percent-current-offer.html and maintained by Discover.